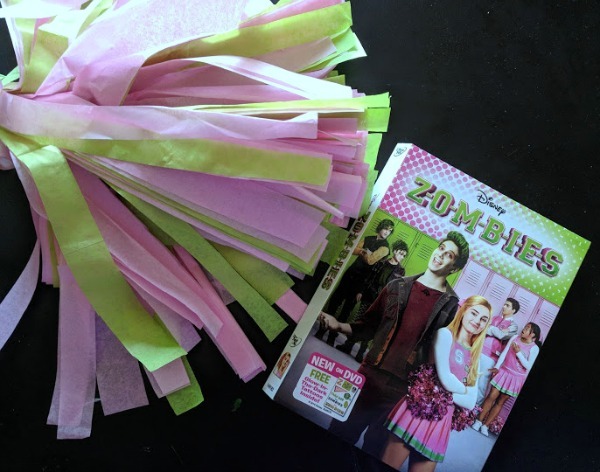 This DIY cheerleader pom pom craft project was inspired by the Disney Channel's new movie, ZOMBIES, which we received to review. What happens when zombies are finally allowed to enroll in Seabrook High School with the humans? 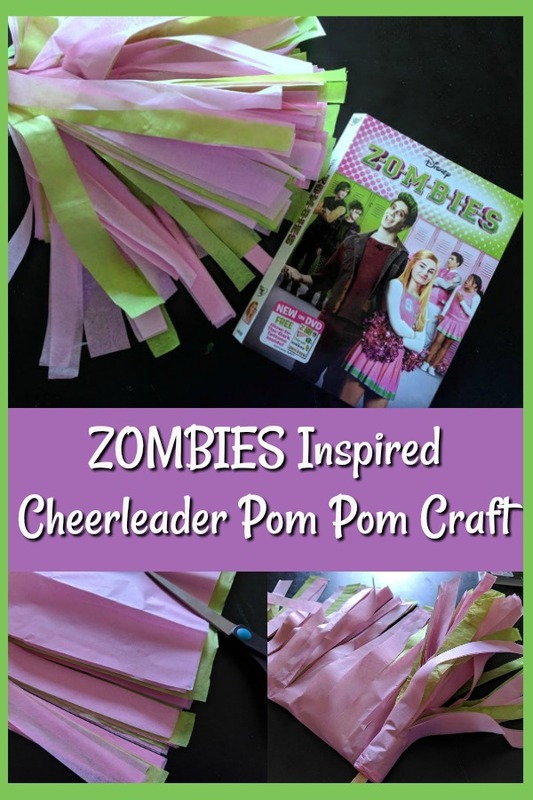 The zombie students face many challenges – the biggest being the cheer squad. The Disney Channel’s newest original movie, is filled with music, dancing, and high school woes – plus zombies! The movie ZOMBIES is set fifty years after a zombie apocalypse happened, which split the town. The humans are bright, cheery, and a lot alike, while the zombies are restricted to the run down Zombietown. Zombies aren't even allowed to have pets. This is the first time zombies are finally allowed to enroll in Seabrook High School with the humans. The charming zombie Zed is determined to play football, but his close friend isn't as optimistic. 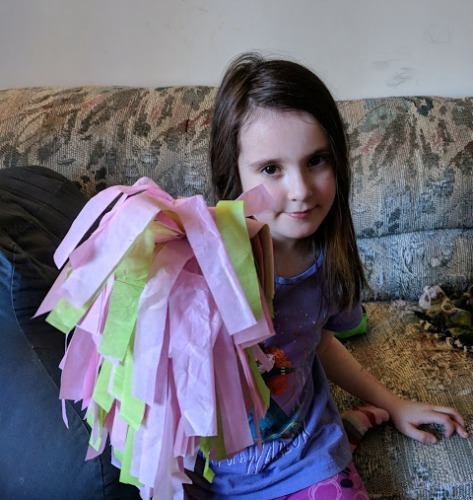 Human freshman Addison, the daughter of Seabrook's mayor, dreams of being a cheerleader — the ultimate form of status in the community. Zed and Addison work together to show Seabrook what they can achieve when they embrace their differences and celebrate what makes them a community. We are big fans of Disney in this house and the kids are showing more interest in musicals. There was no way we were going to pass up watching a family-friendly zombie movie! 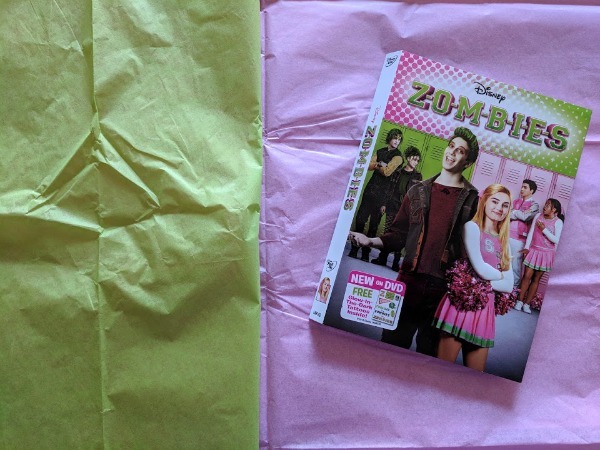 My kids (ages 7 and 5 years old) thought the beginning with the zombie apocalypse was a little scary, mostly because they were unsure what the zombies would be like. Once the singing and dancing started, they became enthralled with the story. The kids commented throughout the movie about how the zombies were being treated at Seabrook High School and how rude Bucky, the cheer captain, was to Zed and his friends. ZOMBIES has an engaging story line that kept the whole family's interest. This movie has great messages about perseverance, tolerance, diversity, and unity delivered in an unexpected way – through zombies. It also provided great conversation about character choices and behaviors throughout the movie and how those impacted others. 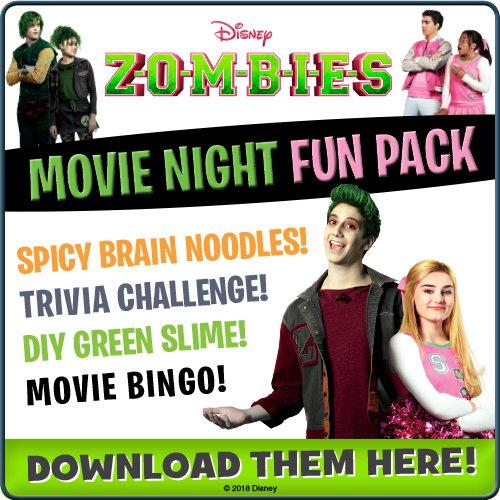 It’s a no-brainer, grab ZOMBIES on Disney DVD! You can make one pom pom or two. Follow these instructions to make one at a time. 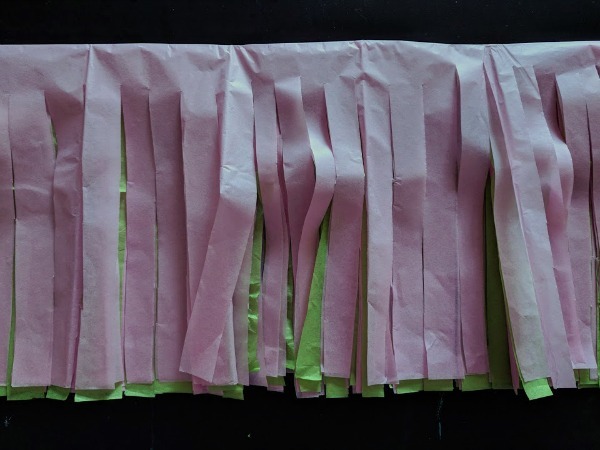 Take 5 sheets of pink and green tissue paper, alternating the colors how ever you would like. I used one sheet of green and four sheets of pink, placing the green in the middle. Fold the stack of tissue paper in half. Cut small strips toward the fold, but do not cut all the way. Leave at least an inch or two. 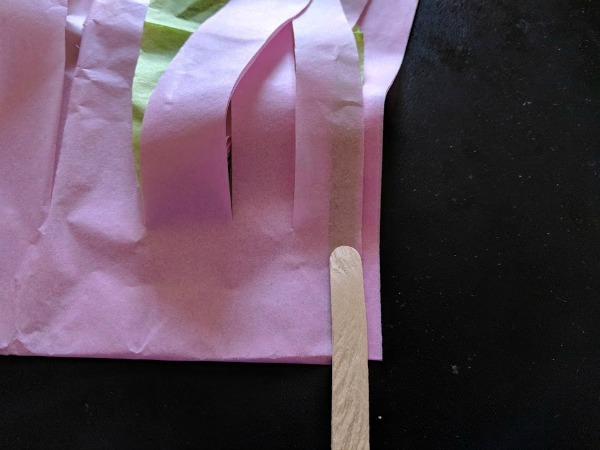 Glue the craft stick to one end of the tissue paper, then gently roll the tissue paper around the craft stick. Once you are done rolling and gathering all of the tissue paper up, use tape to secure it. 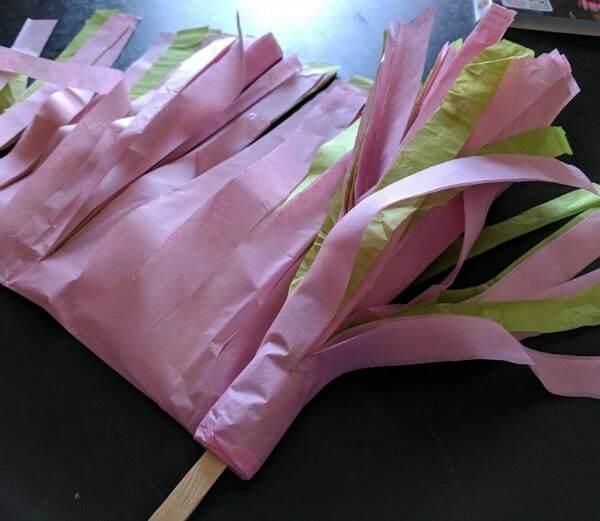 Wrap the tape around the tissue paper and around the craft stick. This is your handle! You can use electrical tape or colorful duct tape for this part. I only had packing tape handy at the time, so that is what I used. Now shake the pom pom! You may need to gently separate the strips of tissue paper and scrunch it to fluff it up. Repeat to make another one!